written Jan 6, 2007 on the live GodlikeProduction live chat. A few weeks ago Tony Blair spoke of increasing Britain's nuclear defense system, stating to the effect that Britain can no longer count on the US to protect her. Today I read about Japan's desire to strengthen their missile defense due to weaknesses shown in the N. Korean test fires earlier this year. It sounds like countries are preparing for war, not against terrorists who have no missile systems, but in preparation of a chaotic world and potential wars with other global powers. The January 6th posting of Inside the White House describes a full-blown meltdown going on in the Bush administration with lower staffers leaving in droves - Harriet Myers' resignation would certainly help substantiate that. The author speaks of near open mutiny against Bush and his policies among the US military both in Iraq and at home. The author claims the military Brass are referring to Bush as Caligula. Are we watching the partial dissolution of the US, somewhat akin to the former USSR? We have often stated that as the Earth changes require the US Military to return to their homeland, that bases will be emptied down to a skelton crew and a more rapid evacuation from Iraq will occur. All of this will be denied. But some allies, which include Britain and Japan, countries that have stood by the current administration steadfastly, have been warned. The US withdrew troops from S Korea, just as the heat was being turned up by N Koreas. Is this protecting Japan, per agreements? Then they moved troops from bases in Japan to Guam, closer to Haiwaii, likewise deserting Japan. Never mind the official explanation, look at the trend! We also mentioned that after the 2006 mid-term elections, which Rove had assured all would fall to the Republicans by virtue of voter fraud, that the Bush White House was in shock. Bush gave pronouncements to the new Congress on how they should act, what bills he wanted proposed and passed, as though he were still speaking to the old Republican dominated rubber-stamp Congress. He is proceeding with a plan to 'stay the course' in Iraq, more troops and no change whatsoever except to try to undo democracy and install a more compliant puppet government in Baghdad. Never mind what the people voted for, and what the Democratic Congress is setting out to propose and enact as law. Republican congressmen are lining up with the Democrats, in droves, so the margin needed to override a Bush veto is increasingly assured. Where is the White House in all of this? Throwing temper tantrums, refusing to listen to any argument not in line with the Bush brain waves. Firing generals so the rest of the Military is moving from quiet mutiny to open mutiny. Shuffling his cabinet like musical chairs in the hopes that the old faces in new positions will somehow work magic. Why not bring in fresh blood? Because the old faces know the dirty secrets, and Bush fears a new face revealing the inner secrets, so very dirty and illegal, if only by an inadvertent muttering. If Cheney goes, Condi will be his VP of choice, and he does get to chose! So someone is being shuffled under Condi so allow for this sudden change. He wants only comfort personnel around him, the group getting smaller and smaller, less and less capable. The Puppet Master wanted the Bush White House to become irrelevant, and it is certainly approaching this! I am unclear how Leo Wanta could have gained control over the elite's set aside accounts. Can this be explained? We have mentioned some means of filling these coffers, such as money stolen from the S&L chaos, when bank after bank was looted; drug running by the CIA even back to the Viet Nam war, when drugs came back inside cadavers, and during the Iran Contra days when the CIA was caught flying plane loads into the US. Certainly the massive amounts of funds given to the DOD over the decades has never been accounted for, the amount supposedly 'lost' due to accounting flaws into the trillions. Realize that money gains, over time, if stuffed away and allowed to be the benefit of insider trading in the markets. Do you suppose that Wall Street is awash in money because they are honest there? The watchdogs in the US government are told to look away, when certain transactions are passed. Money laundering is more than just straight illegal transactions, it is also done legally. Party 1 sells an asset to Party 2, who then takes a bath as the asset loses almost all its value in a false devaluation. Party 2 needs a writeoff in any case, an arranged deal. Part 2 sells the asset to Party 3, for pennies, and then the asset swells to its original value. Money has just been passed from Party 1 to Pary 3 without being able to be traced! Who traces devalued assets? They are considered not worth tracking. Often, parties were used to hold assets, temporarily, by such means. These parties were almost always insiders, knew what they were doing, cooperative. Wanta was cooperative, but as not completely evil has had a change of heart, seeing what the US has become. Thus, he fights to reveal the arrangement, a horror to others he was involved with. Can the Zetas speak to the dizziness, nausea, ear tones, and other problems people have mentioned here today? Also, female problems? There is more than red dust and debris that comes with the tail, as there are unseen elements. During the passage, firestorms light and fall to earth, caused by petrochemicals forming over volcanos. These petrochemicals are present in the tail of Planet X, having been gathered during the many passes through the Asteroid Belt in the past from planets that were pelted to pieces by the moons in the tail of Planet X. Earth herself was subject to just such an injury, thus the great hole in the Pacific, with all her land on one side of the globe. Oil is formed as the tail passes over the heat of volcanos, was not formed by rotting vegetation or animals as asserted by human scientists at a loss to explain oil formation. They cannot recreate oil formation in the lab, so the theory does not stand. Add to the effects of the tail elements filtering through the atmosphere, the magnetic swings. It is more than magnetic particles that are affected, when the swings are violent, as they have become. Humans or animals living under high voltage lines get cancer at a higher rate than otherwise, as well as other illnesses. It has been reported in the Kolbrin that women in Egypt were barren in the months before the last pole shift, and aborted. So not the first time these symptoms have been noted. These matters will not go away, but will increase up to the pole shift, when relief will at last be at hand. In August, 2003, a report allegedly came out of Baghdad of a terrifying new US tank that apparently fires a plasma resembling a lighting bolt combined with fire. The author of the report claims he has seen the aftermath of "flame-throwers, napalm, white phosphorous, thermite, you name it. I know of nothing short of an H-bomb that conceivably might cause a bus to instantly liquefy or that can flash broil a human body down to the size of an infant." I remember reports of horribly charred bodies after the US attack on Fallujah, reportedly results of white phosphorus. Is the report of this tank factual? These weapons have been admittedly used by the Israeli against Lebanon, where white phosphorous was shown to have burned babies that survived. There are no morals in play, in either the US or Israeli camps, these days. They are going for broke, trying to get control of the oil fields in the Middle East, and see themselves losing, the US being evacuated and Bush being forced to evacuation by the new Congress and military revolt. They have wanted an attack on Iran, Bush ordering this several times, under different guises, and being refused by the military. Israel wants to attack Iran, but fears putting itself out there is it cannot count on the US to defend it, and this looks increasingly shaky. Thus, their use of these illegal weapons will come back to haunt them, as the corruption in the Republican led Congress came back to haunt them during the elections. Would the Zeta care to discuss the missing Adam Air Boeing 737-400 at Sulawesi Island? Where this appears to be a mystery, one should bear in mind that Indonesia is more water than land, and a lot of land is mud. The plane is in an inland lake, shallow but enough to cover the evidence. These lakes are not clear, they are filled with vegetation. Thus, it may be some time, if ever, before being found, as the pole shift will not be kind to Indonesia. Can the Zetas explain specifically why Negroponte was demoted suddenly from Director, National Intelligence (DNI) to an Undersecretary of State, while the alleged (former) head of the rump 'Working Group' of Majestic 12 was named to replace him? Even more intriguing; why is Admiral McConnell now going by the name of 'Mike' and not his given first name of 'John'? Does it have anything to do with his pet Disclosure project that the Zetas have claimed is 'already lost'? Negroponte is being moved to State to become the new Secretary of State when Condi assends to become VP, or so the plan. Bush wants only comfort personnel around him, and beyond that, those he can trust utterly to play his game and not embarrass him. There have been dirty dealings in this White House, which is not the first to be exposed to these matters. Gates as Secretary of Defense, after long years under Reagan and working closely with the Senior Bush, for instance. You can be sure that Admiral McConnell is familiar with the Planet X coverup and stolen funds Wanta is trying to make public, as the Navy was at the helm of the coverup over the decades, being the world's time keeper and ruling over the worlds observatories. He fits in! What is the Zeta's take on the seeming stargates and vortexes in the sky above their heads being seen around the world. Many people reportedly seeing this aerial phenomena. The Earth wobble is getting stronger, more violent, and as the weather wobbles show, affects the atmosphere dramatically. The jet stream has not been normal for a couple years now, going in cut-off loops, something unseen before the wobble commenced. Cold air pushed over warm is the cause of tornados on the ground. Would not the same thing occur at high levels? This will not become a high level tornado, but adjustments in the temperatures of various levels will swirl, creating these phenomena. Would the Zetas care to explain the passing of the "mabus comet" and the correlation with Saddam's hanging? Certainly having yet another comet pass by at this time is not the fulfilment of any prophecy. As we have explained, there was no hanging, and certainly no hanging of Saddam as the man in the docket during the trial all these months was just one of Saddam's doubles. Any interpretation that the end of the world, ie the coming pole shift with consequent dramatic die-off of the world's population and a fight to the finish between good and evil, as being caused by the death of any single individual, is simplistic. If I understand correctly, the planets in our solar system align at the sun's ecliptic due to a balancing concentration of particle flow above and below the planets, there by holding them in place north and south in relation to the ecliptic. Since the planets in the solar system align at the ecliptic of the sun, and the solar system aligns along a magnetic flow line of a larger field, then does the entire Milky Way galaxy align along a magnetic flow line of that larger field or an even larger field yet? If so, is the galaxy, like the planets to the sun, aligned at the ecliptic of this larger field? Wouldn't that explain why galaxies appear to be pancake shaped? Where does this larger field originate, the center of the universe? Do particles resonating in harmony cause the pulsing? Yes, a glaxy has a similar explanation for its shape. We have stated that outside of galaxy's, this effect is not in place, it stops at the galaxy level. What holds the Universe together, and how it interacts, is a discussion you would fail to follow, as the majority of the concepts are not concepts you have even entertained. You have a more pressing matter before you, in how to react to the coming cataclysms, and how you plan to help your fellow man. In the early 1950's, was a fly over the White House by several ET Craft to establish a show of contact, a real event kept secret by the government or a made up story? This event occurred during a time when benign aliens were trying to get the attention of MJ12, which was entranced by the Service-to-Self aliens who had first contacted them. Service-to-Self aliens, as Service-to-Self humans, lie a lot, and promised all manner of technology to the eager generals. We have explained, in the Government section of the ZetaTalk website, that power outages were also used to this end, finally convincing MJ12 that benign aliens had the same power that the Service-to-Self aliens were bragging about, in fact, had superior powers. These episodes required the approval of the Council of Worlds, which granted them in order to give a balanced view of the alien presence to MJ12. Thus, an exception to the Element of Doubt rule was made at that time. Could you ask the Zeta if they would comment on reports that NASA has use of and is operating an Aurora space ship, a sort of sub-orbital craft of trianguler shape. Does such a craft exist to lift the Service-to-Self off of the Planet when the Pole Shift occurs? If this craft exists, is this the same triangular UFO's being operated by the Military when the issue of the Alien Presence comes to the comman man? These craft are human, a fact we explained from the start of ZetaTalk. The plan was to muster them forth if the UFO craze moved into panic in the people, explaining that it was these secret craft all along, just human, not alien. During the 1997 mass sighting of a mothership in Arizona, these craft were flown about, for this reason. A recent piece of disinfo from Italy, a supposed leak of Vatican information, claimed these triangular planes could take off into space. Not true, just more bragging to placate the many who are clamoring to be taken to safety else they will not cooperate with the coverup. Bragging, by the US Military and the elite among them. Will the Zetas allow a nuclear war to take place, or will they intervene if such an event were to take place? The Earth at the present time is in the hands of man, but interference is increasingly being allowed as the Transformation progresses. The Earth vote, at the time of Roswell, as to the orientation of her future was, as expected, to be Service-to-Other, and thus visiting aliens in this orientation are inceasingly allowed to interfer with the progress of plans make by humans with their hands on the red button. It is, after all, our future home as well. To understand how this interference works, the rule is that the human should be allowed to proceed as though there were no fail-safe to prevent an atomic nightmare. The human, thus, is allowed to struggle with his good vs evil, Service-to-Self vs Service-to-Other decision making. To the human, it appears as though an accident had happened, so his plans did not proceed as expected. Was the disclosure of Planet X to the world's leaders in the 50's timed so as to not precipitate panic? Why disclose Planet X 50 years ago? We have explained that very few leaders were inducted into MJ12 to learn of the approach of Planet X, and only in the Fall of 2003, during a meeting in France of the heads of state did others learn of the presence already within the solar system. The intention, in the 1950's, was to educate what was then the most powerful democracy in the world, in hopes that the worlds population would be alerted in time to make their spiritual peace with what was coming. Love should prevail, etc. This may still happen, may still play out. It was understood that a coverup would ensue, as it did. It was also understood that most who learned of this would angonize over withholding the information from the public, as they are. The outcome is not yet over, and may go either way. Nevertheless, a failure to educate the likely source of a worldwide honest admission would lessen the likelihood of such an admission. Thus, the approach in the 1950's to educate MJ12. Can the Zetas comment on what extent the leaders of Industry in the US are aligned with Bush? I assume they know about Planet X and follow the line? Industry leaders are indeed aware of the approach of Planet X, and were informed from the start in the early days of MJ12. This is kept close, and in few hands, only enough to ensure cooperation with the White House or other such power mongers. Thus, in the main, these are old men, in the know. As Planet X approaches, the tail elements more visible, the corpus itself larger in view, trying to fog up the view will increase. Chemtrails have not been designed to cause illness for some time, but illness is increasing for other reasons, as noted earlier in this chat. Thus, it is not related. Would the Zetas care to comment on exactly what happened to Saddam's cousin after the staged execution? Where is this individual now? Saddam's cousin was cooperative as soon as captured, as he saw his situation. Anyone who was a double under Saddam was already compliant and without a backbone, as one might imagine. He allowed his forehead mole to be removed, his nose to be slenderized, all before the trial. He threw temper tantrums as directed. He was promised a life away from Iraq as a result, but his hopes that his handlers would honor this have not materialized. At present, he is under house arrest in another country, but most likely will be killed as someone who knows too much. Is the Christian political organization, The Fellowship Foundation, which is known as "The Family", associated with the Bushes and in the know about Planet X? Are they part of Bush's Christian deception? The tentables of the Bush family are immense, and go by the logic that if someone is connected, then they will keep secrets and cooperate. Many would be horrified to find out that their enemies are also a tentacle, and working against them with the help of the Bushies! But, all is on a need to know basis, or has been up until the present. I have tried to send this before but feel it was somehow blocked by somebody. What do the Zetas have to say about the US Army and their desires to take a large section of southeastern Colorado from private landowners. This is reportedly to expand the Pinon Canyon Maneuver Site which is a part of Fort Carson. U S military bases all over the country have closed and now they want to expand this one which is relatively new, this part of Fort Carson having been taken from private landowners during the eighties. In the seventies a Kansas Oilfield Geologist stated privately that this area rests over one of the largest pools of untapped oil in North America. Do they want this land for the oil or for refuge during the coming times due to it's elevation of 3000-5800 feet. [and from Nancy] I have not received this email before so suspect the blocking to be correct. People are more and more distracted, so someone slipped and this got through. They did not wish to make the grab until the end days were upon them, so as not to be obvious. This will not be the only such move. It is of record that the Bush family recently purchased land in Paraguay, another indication of end times preparations, an escape in case things do not go well for this family in the US. The public should take note, that the establishment no longer fears revealing their plans to the public, being obvious. This is a clue that they feel there is scant time for setting up their survival sites, arranging for what they presume will be their private stock of fresh water or prime climate land or oil and gas reserves. They will, as we have often stated, not succeed, for the many reasons that such endeavors will not succeed. The elite assume a top down hierarchy, command and control from above. After the pole shift there will be 1,000 agendas amidst 1,000 people, no assumption of who is in control. Technology will be at a standstill, no repair possible because of the broken link rule, with screaming and demands all around in the halls of the Service-to-Self. The oil reserves will never be tapped, and the land will be returned to groups in the Service-to-Other, who will have our protection. On the 27th of December, Corot, a French satellite was launched from Baïkonour. Its primary mission is to study extra solar planets. It seems to be the perfect tool to study planet X. Corot was presented as a French satellite with only a few other National space agencies involved. NASA was not mentioned. What is the extend of the grip that NASA might have on other National space agencies? Will NASA have access to Corot data on planet X? Can we expect that space agencies from other nations would start to lift the cover up on planet X? It is more the other way around. France does not trust the US and NASA to share! They are doing their own confirmations, as are other countries such as Russia and China. They know the last days are around the corner, and have their own interests to safeguard. The US is viewed as untrustworthy because they have clearly put their own interests first, in trying to invade and sit on the oil fields of the Middle East, for instance, and trying to gain footholds with Israel around the world where they can command territory after the shift. Thus, to be prepared for those last minute moves by the US to grab land and resources, these other countries are doing their own checking. I wonder if children will be more affected after pole shift than adults? Children (except those children who will lead us) will probably miss live colours, which are not so live when there is no Sunlight. So much will change. I hope, reading tales from books for children during gloomy days will make a difference for them. Children are more resiliant than adults, and will adjust better to the changes than their parents. It is the parents who will miss what they have had, and grieve for what they perceive is their child's lost childhood, while the child only sees adventure and opportunity about. It is for this reason that many camps will be led by children, who will not be depressed but eager to embrace the world, whatever the shape it is presented in. Yes, parents should plan to read to their children, but rather than treat them as passive entities, engage them! Give them tasks, important tasks, to build their self esteme. Have them scout the weakage for dishes that are not broken, in order to set a pretty table. Have them plan a play, script this with theme and songs, to present after dinner to the adults. Nancy, are those at the top who would rule the world after the shift still acting under the direction of Service-to-Self aliens or are they now making their own decisions? At what point will interference from Service-to-Self aliens be stopped altogether if this has not happened yet? Look to the Bush family, their fortunes, as an example of a group who worked closely with Service-to-Self aliens, either directly if a member of MJ12 and allowed to have conscious contact or indirectly if not, visitation recorded only in their subconscious. Dubya is about to be caged, as an insane and incompetent and frankly illegal President, whether this is impeachment or being boxed in to the point of being completely irrelevant. Jed is out, as Governor or Florida, and is honestly admitting he has no future. Herbert lost on his last gamble within the banks, thus his public weeping session. The Service-to-Self aliens have left the N American continent, have even left the S American continent, dropping their former human associates like hot potatoes, such is their ilk and loyalty. Thus, Herbert's tears were for more than a monetary loss. They were for his change of fortunes! Would the Zeta care to discuss what is happening in the sky? Are UFOs falling, or is there a battle going on above the Earth, or is Russia's space machinery falling from orbit, or perhaps space junk, as the rumors flying on the internet are implying? Possible meteor or space junk seen all over the region [Jan 4] http://www.9news.com/ Beginning at 6:15 Thursday morning 9NEWS was flooded with calls from viewers. It appears to have been either space junk or a large meteor falling from north to south in the western part of the city. [and from another] http://cbs3.com/ [Jan 4] The brilliant streak of light that raced across the sky west of Denver Thursday morning was a Russian rocket re-entering the atmosphere, NORAD and U.S. Northern Command reported. [and from another] Report: Russian Specialists Study Rocket Debris Sighting Over U.S. [Jan 5] http://www.space.com/ The rocket's pieces that allegedly fell on U.S. territory cannot be parts of Russia's Fregat upper stage that placed France's COROT satellite into orbit on December 27. Specialists of the Lavochkin research and development center, where the Fregat upper stage was manufactured, said that they know the area where Fregat was dumped for certain. It was dumped into the Pacific Ocean on December 27. [and from another] Mysterious Object Crashes Through Roof [Jan 4] http://apnews.myway.com/ Authorities were trying to identify a mysterious metallic object that crashed through the roof of a house in eastern New Jersey. The metal object had punched a hole in the roof of the single-family, two-story home, damaged tiles on a bathroom floor, and then bounced, sticking into a wall. 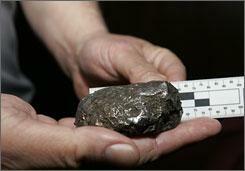 The object was heavier than a usual metal object of its size. No radioactivity was detected. It's definitely not an aircraft part. Magnets held near the rock are attracted to it. Meanwhile, NORAD spokesman said there was no known connection between the New Jersey object and the remains of a Russian rocket that launched a French space telescope last month. [and from another] UFO crashes in SA [Jan 1] http://www.news24.com/ A strange object on an orange cloud, singing like a million turbines - hitting the earth with a bang. A bright object plunged from the clouds to the earth, at a terrible speed, and hit the ground with an almighty bang. It looked like Haley's comet, round in the front and with an orange-red tail following behind. Are these incidences related? If it was space junk landing in Wyoming, then did a piece of this land in New Jersey, simultaneously, looking like a meteor? And drop several days earlier in South Africa, with great fanfare? The answer from NORAD is suspect in light of the co-incidences, and with good reason. This is hardly re-entering space junk, a favorite excuse by the establishment to increased fireball and meteor activity. Who would challenge NORAD? They are in possession of the evidence, and can substitute an item from their inventory, if they wish, to make anyone challenging them look like a conspiracy theorist. This is the tail, returning, turning toward the Earth increasingly as the N Pole of Planet X begins to point directly at the Earth. Red dust, and red skies are also returning to the Earth, not seen since late 2003 when the tail last wafted past Earth. We have long predicted this time, and the damage it would do to satellites and any space habitation man assumes is his birthright. What does the near future hold? This trend will increase, the excuses from NORAD more frantic, and the common man increasingly suspicious. Does space junk produce the red dust of legend? What is the deeper reason for antisemitism in the world throughout history? Does it have to do with the Jewish Exodus during the last Pole Shift? Is it because the Jews call themselves the "chosen nation" and has this caused aversion towards the Jews among other nations? The Jews are certainly not the only group of people who have taken to migrating and thus seem to be without a homeland. The Gypsies, for instance, hail from India but range through Europe and beyond. This does not reflect on the people's as much as where they hail from, the circumstances of their migratory habits. Did the Jews migrate because of the Jewish Exodus? In part, but these habits are more due to the search for better circumstances. The United States was invaded by the white man and settled because of a search for a better life and the opportunity for such an avenue opening up. Those who fled Europe to the Americas did so for greed, to escape oppression, to escape crop shortages that were ravaging an over populated Europe, or for adventure. It is no reflection on the people who migrate, thus, as many reasons are present. Where the Gypsy is clever at slight of hand and being resourceful in various societies, the Jews found they were clever at banking. Should this be viewed as dishonorable, in either group, look to Genghis Khan who migrated with a ravaging horde, murdering all in his path. Is not slight of hand or banking a better alternative? Migrating people's are always resented, as they move into territory already occupied. Unless those who are migrating can strong arm those they are invading, so as to claim the land, this resentment lingers among the original occupants. In the US, where the American Indian was pushed off his land, the victim was blamed, another common occurrence. The Israeli are currently doing this to the Palestinians, for no other reason than greed for land. The Jews, being very successful bankers, were resented for more than their migrant status, as they most often became settlers and thus, land owning citizens. They were resented for an entirely different reason, that being the resentment those less talented have for the talented. Once again, not a new human issue, as those with brains or beauty or in possession of an inheritance or resources are often resented out of jealousy. Jealousy reaches an intensity when the jealous one is feeling pain, feeling their lack, and thus the scapegoating of the Jews during Hitler's era, a deliberate campaign to deflect the rage against the political power structure during a time when the economy was devastating to the average German citizen. Antisemitism is not unique. One could name hundreds of resentments in place today, against women in power, against Hollywood, against the Christian ultra-right, against the various races where ever they are not in their own country, against the young, the old, the complacent middle class, the restless lower class, the greedy upper class, against the power structure, whatever that may be, and on and on! It's not just against the Jews!